It’s a hotel that offers all the benefits of boutique accommodation right in the midst of the city centre, and is Gisborne’s first fully integrated hotel and conference facility. Our rooms are spacious, with plenty of natural light, elegantly appointed and very comfortable. All our 48 suites have an LCD flat screen TV, Sky TV, free wi-fi, a mini bar, air conditioning, an iron and ironing board, hair dryers and tea and coffee making facilities. 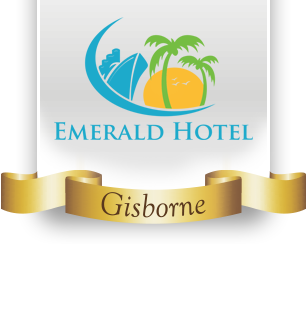 The Emerald Hotel and Conference Centre located at 13 Gladstone Road, Gisborne, in the heart of Gisborne surrounded by the Gisborne city's shops, cafés, theaters, museum and inner harbor marina.